I found this quote this morning and had to make a card for it because it’s so pertinent to my life, especially at this moment in time. As you may know, my Dad is very sick and in the ICU at the hospital. Due to my recent surgery, I am not supposed to visit him due to his illness and I can’t even begin to explain how heartbreaking it is to know that I cannot be there to help him. Not that I think I could really DO anything for him as his doctors and nurses are doing their best to heal him, but it’s quite hard to feel so helpless. There are moments where we worry that we may lose him and in those moments, my heart breaks because I think that I may not see him again. That is hard to bear. But I am reminded of the few hours we recently spent just chatting the 3 of us (Mom, Dad and me) and my heart feels lighter as I know that I will always have that memory of him. AAngel, my sister, has been so amazing for me with helping me to feel like I am a part of Dad’s journey and our family’s journey with him. She has sent me videos of Dad telling me he loved me, she has put the phone up to him so that I could hear him speak to me and she has kept me in the loop at all times. I am so blessed to have such a thoughtful, kind and generous sister. My point today is TIME ~ please, use your time with others wisely ~ don’t lose a moment where you can make a difference by connecting with others in a special way ~ take the extra moments to do something good with your time, to help someone, to make a difference, be patient, be thoughtful, treat them as you’d want to be treated. 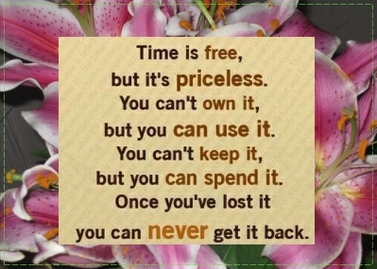 BE GRATEFUL that you have the time to share with those whom you love! Hold close those whom you love, forgive, forget, make the time count with them, take pictures of the happy times, take videos of those special moments ~ even the mundane moments because when there is a threat of losing that person, you will hold close those moments in time, live on with those memories and you want them to be sweet and not sour. My Dad can be persnickety (a nice word for him) and we’ve all had our moments with him. It is hard to watch a strong-willed man struggle for breath as his body fights to heal itself. Learn from my experience ~ you have been given THE PRESENTS OF PRESENCE (my FB page) ~ use them wisely, use them thoroughly and use them to enhance your life and the lives of the people who surround you! We only have this moment in time…Enjoy it! Remember to tell those whom you love, how GRATEFUL you are for them! ← Gratitude Day 11 ~ Thanks, Man!